Home renovation, construction and decoration can be challenging for homeowners for a number of reasons. For some, it’s the overwhelming task of deciding what to do and where to start. For others, it’s the financial burden of hiring a general contractor to help them plan and do the work. If you’re a home-improvement enthusiast getting ready for a DIY project, it’s smart to have multiple resources at your disposal to improve your know-how and enhance your skills. In these situations, as in many others, sometimes the most effective way to get the information you need is through the good ol’ Internet. According to media research provider eMarketer, more than one-third of homeowners start their projects online, with over seven in 10 DIY shopper respondents using the Internet for information or help in starting a project. YouTube is an excellent resource for homeowners wanting to be handier around their house. Unlike some highly scripted TV shows, home improvement channels on Youtube typically exude a much more detailed and realistic view of what renovation projects are like. Whether you’re looking for some design inspirations or simply want to learn about different installation techniques for metal roofing and other remodeling tasks, many YouTube channels can help you find your way through the home improvement jungle. As your trusted home improvement and roofing contractor in the Pacific Northwest, State Roofing is here to help as well. Here, we list some of the best YouTube channels you should follow to help with your remodeling efforts, pointing you in the right direction to ensure you start your project right. This Old House’s YouTube channel is popular for a reason, covering a wide range of topics for its subscribers. With close to 1,400 videos on a variety of topics, such as lawn care, landscape design, flooring installation, residential roof installation and plumbing repairs, the channel certainly offers answers to many DIY home improvement questions. In addition to their usual how-to videos, This Old House also does Q&As with viewers, as well as an in-depth discussion of different home improvement materials and tools. Each video runs like a mini TV show episode, so you can expect a few different topics to be discussed at one time. No worries, though, as they are all very easy to follow. Tim Carter, the key person behind Ask the Builder, has been the go-to advisor for millions of homeowners over the last few years. On the Ask the Builder YouTube channel, he gives the same sensible advice, answering questions as he does on his blog AsktheBuilder.com. The only difference is that his YouTube channel features dynamic, friendly and fast-paced videos to help with your home improvement efforts. Carter covers a wide range of topics, from how to install cool metal roofing to whether or not you should hire an expert for your roof repair. He also explains the unique features of different materials and gives his professional recommendations on each one to help you make a sound decision. Whatever home improvement project you’re planning to tackle, Carter’s easy manner and ability to give simple, yet informative answers will keep you watching and, more importantly, get you more excited about your project. With nearly 400 videos uploaded on their YouTube channel, Build.com provides homeowners with the perfect mix of various home improvement angles. When you visit the channel, you can expect plenty of different DIY and how-to design videos , as well as product features, styling ideas and inspirational videos for viewers who are just trying to get a handle on what is it they want to accomplish with their renovation projects. The DIY Network’s YouTube videos aren’t just for DIY-ers, what with the channel offering an extensive look at all areas of home renovation and repair, including home design tutorials. Whether you’re looking for inspiration for outdoor decks and bathroom remodeling or handy tips and tricks on completing basics tasks around the home, DIY Network has you covered. 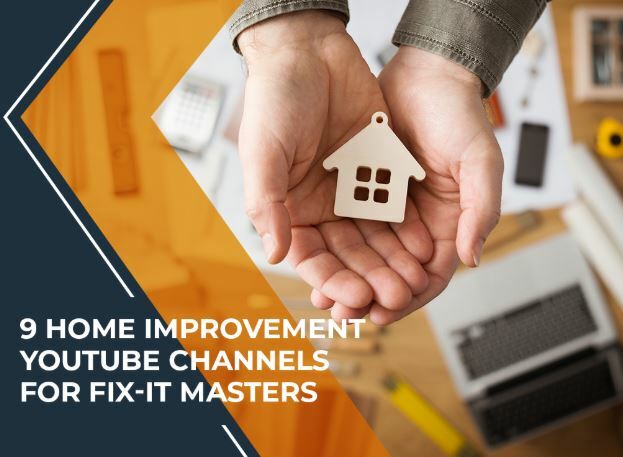 Hosted by expert handyman and real estate entrepreneur Jeff Patterson, the Home Repair Tutor YouTube channel has nearly 300 videos that tackle a wide variety of home improvement topics, such as electrical, plumbing and carpentry, as well as repairs and remodeling. Putting your home on the market soon? Patterson has a “cleaning” playlist that can boost curb appeal and overall neatness for your property. The playlist includes handy tutorials on issues like removing oil stains from concrete and ways to effectively clean grout. Acting on these little problems around the home can help bump up your property’s value when it’s time to sell your house. The House Improvements YouTube channel, run by journeyman carpenter Shannon from House-Improvements.com, covers a broad range of topics, including carpentry, electrical and plumbing. Over the last few years, he has produced over 200 DIY videos that range from beginner-friendly renovations to more complicated jobs, such as hanging drywall and wood-stud framing. You will relate to him as his manner of explaining these things is simple and easy to understand. Whether you’re looking to tackle a major home upgrade or just looking for tips of a minor project, his channel will prove very useful. Shannon is not as popular as other home improvement personalities but if you want no-fuss help with your home DIY renovations, his YouTube channel is a must-follow. Mark Donovan handles the Home Addition Plus YouTube channel, which currently features hundreds of videos tackling various aspects of DIY home improvement and remodeling. Straight to the point and coherent, Donovan’s straightforward approach is easy viewing. It’s important to note, however, that some of the videos don’t provide a comprehensive walkthrough of every aspect of a process, making them more suited for those with prior home improvement knowledge. Nonetheless the videos can give you a general idea of what a renovation project is going to look like in your home and what it entails. The official YouTube channel of Lowe’s, one of the most popular home improvement and appliance stores in the U.S., is your one-stop resource for all your DIY needs around the home. It offers easy to understand how-to videos, landscaping and lawn care ideas, and other inspirational projects. This is an excellent resource for newbie DIYers as you can expect step-by-step instructions from their content. This YouTube channel is the brainchild of a former hardware store owner who made it his goal to help people accomplish projects around their homes. With more than six years of how-to videos at your disposal, you’ll likely find something that can guide you through renovating, decorating or repairing different aspects of your home, although plumbing and repair issues are his specialty. It’s safe to say he’s the go-to guy when you need help replacing your water heater pressure relief valve or fixing a toilet problem. When planning to a home improvement project of your own, you’ll find a good starting point in these YouTube resources, as most of these channels can guide you in accomplishing your tasks through a detailed step-by-step process. While it can be rewarding to do home renovations on your own, don’t forget to consult a professional, especially if you’re tackling something as large as rubber roof replacement. A little bit of expert help doesn’t hurt, after all, and working with a professional can even ensure the success of your project while avoiding unnecessary mistakes and guaranteeing you make the most of your investment. State Roofing is a go-to roofing company for high-quality home improvement and roofing installation services. We have a team of specialists ready and waiting to help you plan, prepare and accomplish your home improvement goals in the most efficient manner possible. You can also follow us on YouTube if you need professional insights on any home improvement task. Remember, expert help is only one click away!